Soon after Malaysian Airlines MH17 crashed near Donetsk, Ukraine on July 18, killing 298 people, the BBC website quickly, and rightly, set up a 'LIVE' feed with rolling reports and commentary on the disaster. This was clearly an important and dramatic event involving horrific loss of life with serious political implications. The public would, of course, be searching for the latest news. By July 18, around 300 people had been killed in Gaza, 80% of them civilians. The Israeli-Palestinian conflict is a key political issue of our time, one that was clearly developing by the minute after July 8. And yet at no point had the BBC set up a 'LIVE' feed with rolling news. Obviously, Israeli suffering also merits compassion, but these military deaths were overshadowed by a far higher loss of Palestinian lives, most of them civilian men, women and children. The toll currently stands at 746 Palestinians killed and 4,640 wounded. Israel has suffered 32 military and two civilian deaths. One foreign worker from Thailand has also been killed. In the following days (and at time of writing) the live feed was cancelled; a period that has seen hundreds of Palestinian deaths and a handful of Israeli military deaths. For some time on the morning of July 21, the sole Gaza content on the BBC News home page was 'Breaking News' of an 'Israeli soldier missing in Gaza'. Remarkably, on the morning of July 23, when 18 Palestinians were killed, the BBC set up a live feed for the wrecked Italian cruise liner Costa Concordia, which showed the ship being towed to Genoa. There was no live feed for Gaza. The BBC has supplied names, ages, pictures and emotive background stories of the Malaysian air crash victims while, with rare exceptions, Palestinian dead have been presented as nameless figures, briefly mentioned, then forgotten. The level of BBC bias was emphasised by an article headline that placed inverted commas around the siege in Gaza, as if it were a matter for debate: "Palestinian PM says lift Gaza 'siege' as part of ceasefire". The BBC subsequently changed the title, but a tweet promoting the article with the original wording remains. In other words, BBC News presented Hamas rocket attacks as the stumbling block to peace, exactly conforming to Israeli state propaganda. In a report on the same edition of News at Ten, the BBC's world affairs editor, John Fidler-Simpson CBE, asserted that 'one reason why casualties on the two sides are so out of proportion' is because 'Israel has developed the world's most effective anti-missile defence'. 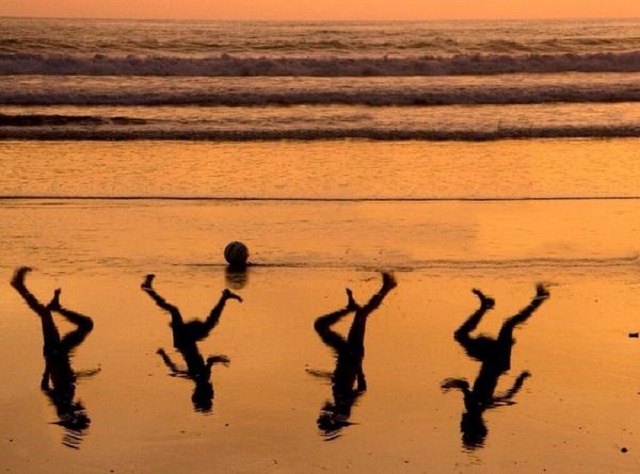 This worked well to obscure the truth that the boys had been killed while playing football on a beach. Artist Amir Schiby produced a wonderful, moving tribute to the Bakr boys. Despite the unequal battle and high civilian death toll, no high-profile advocates of the West's 'responsibility to protect' ('R2P') civilians in Iraq, Libya and Syria have been calling for 'intervention'. Who Starts The 'Cycle Of Violence'? The term 'cycle of violence' often occurs in corporate reporting of the Israel-Palestine conflict. But who starts the cycle spinning? A study of news performance in 2001 by the Glasgow Media Group noted that Israelis 'were six times as likely to be presented as "retaliating" or in some way responding than were the Palestinians'. The Guardian readers' editor, Chris Elliott – ostensibly the newspaper's watchdog on bias in language and presentation - echoed Israeli propaganda, describing Israel's current attack as a 'counter-offensive'. Corporate media have generally not identified these deaths as initiating a 'cycle of violence'. According to human rights group B'Tselem, 568 Palestinians had been killed by Israeli security forces from January 2009 till the end of May 2014; 84 of those fatalities were children. Over the same time period, 38 Israelis were killed by Palestinians in Israel and the Occupied Territories. Many expert commentators argue that the deeper cause behind the latest violence is in fact Israel's opposition to the Palestinian unity government, including Hamas, formed earlier this year which has been recognised even by the US. 'But with the Palestinian death toll rising over 300, it is the Hamas leadership that has come under increasing pressure from multiple international sources to accept an immediate ceasefire in Gaza. '[T]he two Palestinian resistance groups Hamas and Islamic Jihad have set forth ten conditions for a ceasefire and ten-year truce with Israel. 'It's the siege, stupid. Talk to virtually anyone in Gaza and they will tell you the same. The siege is living death, slowly crushing the life out of Gaza. It has to end. The bias in failing to report the brutalisation of a trapped, impoverished people under occupation is staggering. Many might wonder why journalists fail to speak out. But several journalists who have exposed Israeli actions, and media bias favouring Israel, have been punished. Ayman Mohyeldin, the NBC News correspondent who witnessed the killing of the four Bakr boys, and whose reporting of the tragedy moved many readers around the world, was subsequently 'told by NBC executives to leave Gaza immediately'. Glenn Greenwald reports that NBC executives claimed the decision was motivated by 'security concerns' as Israel prepared a ground invasion. But NBC then sent another correspondent, Richard Engel, into Gaza with an American producer. The day after Mohyeldin was pulled out, CNN correspondent Diana Magnay was removed from covering the conflict after she reported Israelis cheering the bombing of Gaza from a hillside overlooking the border. When the people cheering allegedly threatened to destroy Magnay's car 'if I say a word wrong', she described them on Twitter as 'scum'. Jebreal said that in her two years as an MSNBC contributor, she had told her producers: '"we have a serious issue here". But everybody's intimidated by this pressure and if it's not direct then it becomes self-censorship'. Blumenthal reported that an NBC producer, speaking anonymously, had confirmed the reality of 'a top-down intimidation campaign aimed at presenting an Israeli-centric view of the attack on the Gaza Strip'. 'Sometimes the CIA or the director of national intelligence or the NSA or the White House will call about a story... You hit the brakes, you hear the arguments, and it's always a balancing act: the importance of the information to the public versus the claim of harming national security... Over time, the government too reflexively said to the Times, "you're going to have blood on your hands if you publish X" and because of the frequency of that, the government lost a little credibility... But you do listen and seriously worry... Editors are Americans too... We don't want to help terrorists'. But editors should remember that they are human beings first, Americans second - to behave otherwise risks supporting their own government's terrorism and that of its allies. For in truth, biased US-UK journalism is empowering the Israeli government's effort to terrorise the Palestinian people into accepting gradual genocide as their land and resources are stolen. As we have discussed here (see also Gideon Levy here), the hidden backstory is that this land grab can not be conducted under conditions of peace. It requires Perpetual War; a phoney, one-sided 'war' dominated by Israel's perennial trump card: high-tech military power supplied by that eternal 'peace broker', the United States.